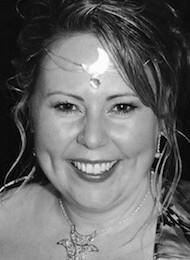 Denise is a Reiki master, mystic mentor, teacher and writer. She loves to assist and light a path to the mystical inner worlds of feeling, knowing and creation. For fifteen years she has been dedicated to guide and heal through readings, meditation and Reiki. She offers Private Consultations, Classes and Courses. In 1997 one door closed and another opened. Denise had the choice to step through the new door or lament on the past. For a while, she had a foot in each door, too scared to let go or move forward. As time passed she began to forgive herself and all and re discovered her lost mystical being, allowing her to let go of the past. She began meditating, then studied and practiced remedial massage which led her to become a Reiki Master/Teacher, meditation facilitator, intuitive tarot card reader and to learn and practice many other energetic healing and counselling modalities. Her studies are far and wide including philosophy, theology, psychology, the paranormal, counselling, sacred geometry and symbology. Denise’s instructions on how to use oracle card decks and a range of different card spreads have been published in many decks by renowned artist and author Toni Carmine Salerno. In the middle of 2014 her Wisdom of Astar oracle card deck will be available and later on in the year a meditation CD and a book on Tarot will be released. Every Wednesday evening at 7.30pm – 9pm $20 – All welcome Guided visualisation for the transformation and healing of you and the planet. Once a month on a Monday evening from 7.30pm – 9.15pm. All levels – In a relaxed and casual setting enjoy an evening of giving and receiving information and healings with likeminded beings. $20 2014 Reiki Practise/share dates May: Monday 5th, June: Monday 2nd & 30th, July: Monday 28th, August: Monday 25th, September: Monday 29th, October: Monday 27th, November: Monday 24th, December: Monday 22nd. A clear healing energy from your higher self and the love of the universe to heal. Great for soothing physical or emotional pain, centring and balancing or if you want to work on any particular issues. Clear guidance with your soul/higher self for the purpose of empowering and informing. Great if you have any particular questions or to become aware of the energetic themes around you and where your path may be taking you. A clear conversation with your higher self through Denise and “Astar” to move you in a direction of something new, aligned with your dreams and desires. Great if you are ready to create something new or different, to move beyond your ideas and beliefs or if you are feeling stuck. A clear feeling from your soul to free you from all that holds you away from the present moment, by allowing all to be exactly as it is in this moment. The Genki Centre | 1 Arundel Street Glebe NSW 2037 | ph. 02 9552 3105 | e.